Everton have taken a valuable three points away from Craven Cottage after a smash and grab 3-1 win this afternoon. The Blues took the lead after only three minutes with a wonder strike from Royston Drenthe, but then had to endure heavy pressure until Bryan Ruiz finally converted an equaliser for the Cottagers after 67 minutes. However, after a open goal miss from Bobby Zamora in injury time, Louis Saha and Jack Rodwell secured the victory for the Toffeemen. 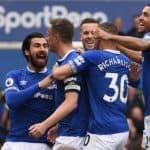 Everton were far from their best today – indeed, apart from the opening twenty minutes, Everton were dreadful, unable to retain possession and allowing Fulham to attack at will with good movement from the likes of Andrew Johnson and Clint Dempsey. But they were starting from a disadvantage after they switched off early on to allow Everton to open the scoring. Some neat interplay around the box allows Royston Drenthe to drive a wicked curling shot beyond goalkeeper Mark Schwarzer after an electric opening to the game. The next twenty minutes following the goal saw Everton take advantage of a shellshocked Fulham, with Drenthe, Vellios and Fellaini doing well and looking dangerous – Vellios missing the most blatant chance with a free header from five yards. That said, the familiar shortcomings that have plagued Everton since the start of the season began to surface – an isolated striker, poor ball retention and a nervy defence all combining to give Fulham encouragement as the first half progressed. The second half began in much the same vein, and even the early introduction of Louis Saha for the ineffectual Vellios was not enough to stem the tide. It was a moment of pure quality from Fulham summer acquisition Bryan Ruiz which resulted in the deserved equaliser, as the Costa Rican evaded Hibbert and curled a lovely chip over the top of Tim Howard to level it with 23 minutes remaining. Predictably, it was his first goal for Fulham. Everton were then up against it for the rest of the game. Fulham had several chances to take the lead, notably via Ruiz who was denied by the feet of Tim Howard, whilst Everton only had a quick effort from Saha which was denied by Schwarzer to speak of. 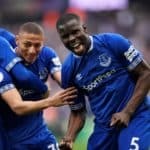 The Toffees rode their luck for large periods of the game, but it looked to have run out as Johnson unleashed Zamora, who danced around Tim Howard to leave himself an open goal. 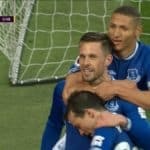 However, the striker managed to somehow not hit the target when it looked harder not to, as he hit the bar to the delight and relief of Everton fans, who thought their side had secured an unlikely point. Yet it was to turn into three. Twenty seconds later, on the counter attack, Louis Saha brushed off an unbalanced Chris Baird, advanced on Schwarzer and prodded a left footed effort in off the post to send the travelling Evertonians into uproar. The icing on the cake arrived two minutes later, as a Drenthe free kick was half cleared as far as Jack Rodwell, who scuffed a low shot beyond Schwarzer to put a gloss on the final score. Everton didnÂ´t deserve the win, the team selection and balance was highly questionable with the usual inadequacies of the negative 4-5-1 present, but youÂ´d be hard pressed to find a Blue who cares at the moment.